When talking about critical broadband connectivity for public safety, we are talking about saving lives. The availability of the online information is thus of the utmost importance. If one tries to fetch information from criminal records, the latest blueprints of a building in case of fire, or send cardio information to a doctor in hospital, connectivity is crucial. It might not be a matter of a second or two, but one certainly cannot wait minutes for data to be delivered. In critical communications, the command and control application become a focal point. With an efficient C&C application one can share information about other units’ locations, target drawings and other various case specific information. The more instantaneous the data is, the better security it provides for the officers on the case. We have seen live situational pictures shared from the criminal site to enhance co-operation and to minimize the inefficient use of mobile voice terminals. I wish to underline that 99.9% of the usage of broadband data in public safety is outside of a big catastrophe. This is normal day to day work for public safety personnel. When this work can be made more efficient, the savings are immense. Let's look at the network infrastructure requirements of the solution. The most common mistake public safety has made is to rely solely on one commercial broadband network. It almost seems like all concentration with development is on the applications. Too often, connectivity issues are handled without due consideration “…oh and we’ll use the broadband of the number one commercial operator, with a dongle or similar.” The fact is no single network, especially a commercial one, is ever enough. The networks are built and designed in a way that do not enable 100% availability regardless of coverage. Commercial networks have occasional service breakdowns, on larger and smaller scales. These networks also have IP addressing scheme changes that cause links to break down. This requires new connection set-ups that always take time. Typical availability, under the coverage area, over any larger single network when in full operation is about 96-98%. The most obvious and most employed solution to the broadband question in the market is to repeat the previous narrow band and voice implementations in the new environment. The communication of public safety has previously been done by dedicated networks. It all started with RF – radios. With digitization, the P25, Tetra and Tetrapol technologies were implemented. These regional or even countrywide implementations have been paid for using taxpayers’ money and the arguments in support of these networks have revolved around availability during crisis situations. Well, no solution is 100% reliable and despite little official communication on the subject, we know that existing digital PMR networks are far from being perfect. A good question today is if a dedicated network is even needed for voice services? There are novel push to talk possibilities and various MVNO approaches that could even replace the existing networks. If we select a dedicated network for public safety use, we should consider the cost vs. benefit. If the network has already been built, it certainly makes sense to use it, but building a new one is another question. The approximate amount of users on a dedicated network compared to a commercial one is about 0.5%. Dedicated networks builders argue that this small number of users isn’t interesting enough for commercial operators. Is the answer to build another network with even higher availability requirements? With a simple calculation, the cost would be 200-fold per user. How much are the public really prepared to pay for these services? There is always a limit to everything and I have a hard time believing that a dedicated network, especially a Broadband one, would be accepted anywhere as the only possible solution. I understand the need for coverage in remote areas where there is no business case for the connectivity of commercial networks. This can however, also be covered by satellite. This last alternative is somewhat like what FirstNet is doing in the US, the Emergency Services Network (ESN) in UK, and Red Compartida in Mexico. There are more, but these are maybe the most important ones right now. The idea is to combine the existing infrastructures of commercial operators and to build more infrastructure and robustness into the solution. The major thinking behind these approaches are dedicated frequencies. The problem here is that dedicated frequencies offer neither high availability nor resilience. For that you need robust infrastructure. This solution would also still rely on a single network at a time, with all the associated problems. Why try to create robustness where it already is available? The best solution is at hand with a multiple network approach. Finally: implementing some resilience, like battery backup for base stations, can occasionally be a good idea. New infrastructure where no networks are available can be justifiable, but there is no need to build anything extra when it is not really needed. The worst scenario with these old-school approaches is that lots of money will be spent and the customers will not be happy. Often in these cases, after the false investment has been made, the critics are silenced. Finally, and sadly, users are not given any alternative for a better solution, which is a multiple network approach. One benefit of using multiple networks comes through security in case of interference. If someone tries to jeopardize the functionality, or manages to block the traffic of one network, the possibility to use several connections solves the problem. One can always use rapid deployment connectivity via extra LTE or 5G networks, use WiFi, or satellite alternative. 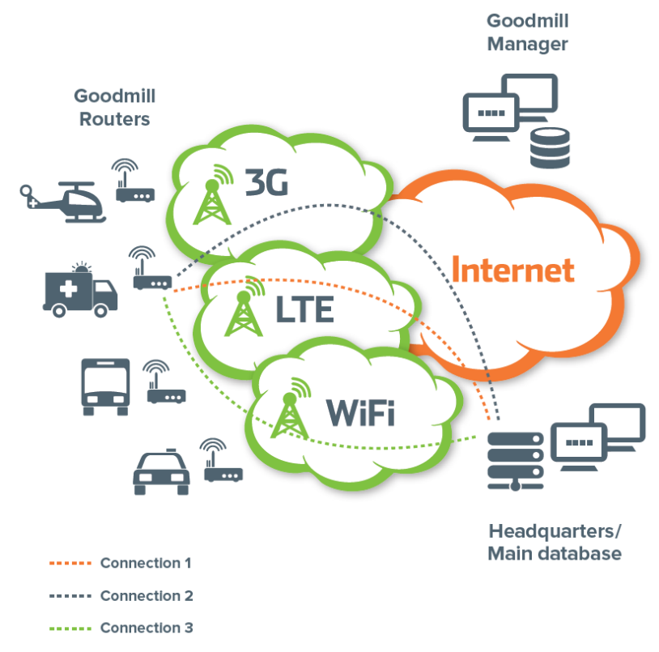 The best about the solution Goodmill offers is that these alternative networks can be used automatically; the system selects the best or the most viable connection, depending on how the switch over protocol is determined. Everything previously discussed summarizes that utilizing a combination of networks brings availability to the accepted level for Public Safety mobile use. It is always a matter of resilience that dictates what the approach selected in each region or country will be: how many networks and what type of network enhancements are required. In our experience, with constant monitoring capabilities and Mobile IP enhanced session persistence, a multiple network approach that auto selects the best network, exceeds the current needs of public safety. There are, however, few important criteria that must be met. First, the multi-channel routing solution needs to have a short switch-over time between networks. Second, sessions need to stay up when the IP addressing changes. Thus, the solution needs to be network agnostic, so that the applications don’t have to know anything about the occurring changes. The multiple network solution has proven extremely reliable and cost-effective all over the world. 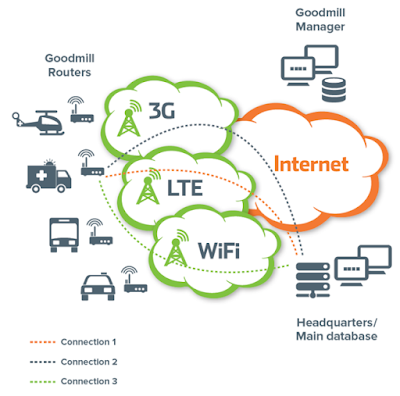 Goodmill has one of the largest installed base of managed multi-channel routers in public safety in the world. The solution has been proven in nationwide implementations for years. Of course, the products need to meet the highest standards. 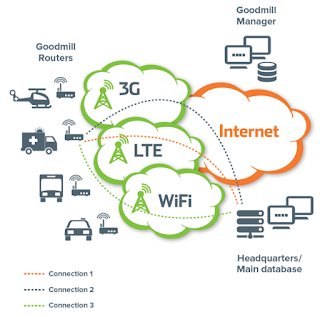 As an example, Goodmill products have MBTF of more than 400,000 hours for the routers in use. Our clients can constantly monitor the connectivity situation. The remote management (over-the air) OTA capabilities provide a constant online view of fleet connectivity and provides access to routers whenever needed. This is the connectivity platform that meets the hardest public safety requirements. In the past, there have been huge investments into public safety networks around the world. Investments into digital voice solutions with country-wide coverage are still ongoing in many countries, with Germany and Norway being the latest and widest implementations. Big infrastructure providers have been earning good revenue with these national roll-outs. Now, as the old technology cannot provide the data rates required, many of the traditional players are planning on selling new broadband networks the same way in the future. There is however, a new ‘Blue Ocean’ concept that changes the whole business model for public safety broadband. This is good news for taxpayers, but poses a significant risk for the previous rulers of the marketplace. Before I get to that, let’s summarize what ‘Blue Ocean’ in this case stands for. This term was invented by W. Chan Kim and Renée Mauborgne in their book “Blue Ocean Strategy: How to Create Uncontested Market Space and Make Competition Irrelevant”. The idea is that you don’t only develop and enhance your offering to win markets, but you can redefine it by introducing aspects of elimination and reduction. With the new model, we can reduce or even eliminate investments into new networks and simultaneously improve data security, reliability, coverage and resilience. And all this at a fraction of the cost of the old business model. Whenever talking about public safety, the argumentation for selling solutions has been around the importance of the service itself. I’ve heard arguments like “TETRA is the only technology you can trust on your life” or “dedicated and government controlled networks are the only solutions that fulfill the availability and resilience needs of public safety”. As we know that Tetra is far better suited for critical communications than a single commercial network, these statements are still not true. The digital PMR, when introduced, was the only suitable solution. It has given over the years us great benefits, is very useful today and will continue to add value in the future. However, we also know of numerous situations where TETRA, Tetrapol or P25 networks have been down or unusable due to congestion problems. These, like any single network solutions, are still vulnerable to storms and other natural catastrophes. The dedicated PMR networks too often get overcrowded when needed most. Simultaneously, when there’s nothing important going on, the networks are using even as little as 2-5% of their capacity. This means that there is a huge investment standing unused most the time, yet failing unfortunately often when needed the most. If this is what the current situation is, do we really need dedicated networks business model in the future? Are there solutions that can outperform the availability and resilience of a single network investment? I think these are questions worth asking. 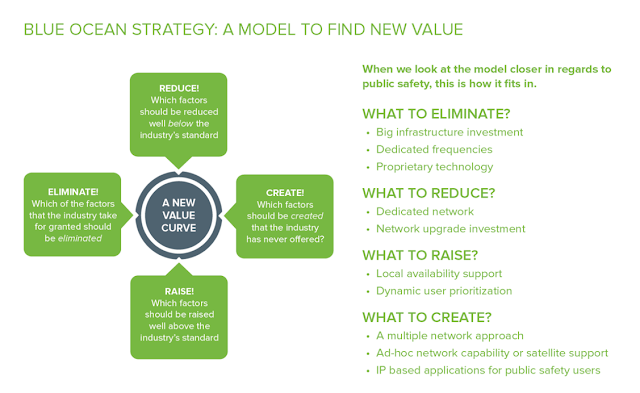 The new strategic alternative comes from eliminating the need for new networks. We already see solutions for fixed landline based internet where dedicated secure networks are built inside a commercially available one. VPN tunneling or MPLS technologies are commonly used in the PS sector today. The solution is to combine commercial networks, as many as one wishes, and use secure tunnels inside them. This way, the existing infrastructure of all mobile operators can be used, taking advantage of the resilience, availability and operational security they can serve together. This is very important to understand: the existing, separate networks can offer these benefits when used in unison. The same reason we have two ears and eyes. It is possible using these separate networks to have secure tunneling running simultaneously across them all. This means that the costs of the solution are magnitudes lower than building an entirely new network anywhere with any significant coverage. To read more about the ultimate solutions, check this white paper. By Juhani Lehtonen, VP Sales & Marketing of Goodmill Systems Ltd.